Boasting a helpful dual core design, the processor runs at 2.93 GHz per core for a smoother multitasking experience. Different tasks are automatically assigned to separate cores. 64 bit computing can improve performance when you're running multiple programs at once. 1 X T9800 Processors. ETA 3 to 6 Weeks. Product Specification. The CPU Mall. AMD FM2 904 pin CPU. AMD 938 pin CPU. AMD 940 pin CPU. AMD Phenom II X4 B95 3.0GHz 6MB Quad-Core Socket AM3 CPU Processor. AMD Phenom X4 9950 2.6GHz 600MHz Socket AM2 CPU Processor. AMD FX-4300 3.8GHz Quad-Core (FD4300WMHKBOX) Processor. Clock Speed 2.93 GHz. Processor Type Core 2 Duo. Processor Features Quad Core. Front Side Bus Speed 1066 MHz. For Kingston SATA III SSD UV400 2.5" 120GB TLC Internal Solid State Drive (SSD) . 16PCs Easier Shoelaces Elastic Silicone Flat Shoe Lace Set for Kids /Adults . I will provide more excellent products to you! If you are not satisfied with goods or other problems, don't worry leave negative evaluation! Until you satisfied! 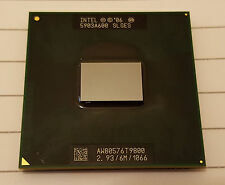 Intel Core 2 Duo T9800 SLGES CPU 2.93Ghz 6M 1066MHz Socket P 100% working! Tested with 100% perfect working condition! If you are not satisfied with the product because its faulty or you don't want it. Marked your order No. Front Side Bus Speed 1066 MHz. Processor Type Core 2 Duo. Clock Speed 2.93 GHz. For Dell Venue 11 pro 7130 7139 5130 7140 Tablet Monitor Touch screen LCD Screen. Socket Type Socket P. Processor Features Quad Core. You should receive item within 2-4 weeks. It is very important, we need it. Other countries. Japan,Singapore,Thailand,Malaysia,India. Part number AW80576GH0776MG. 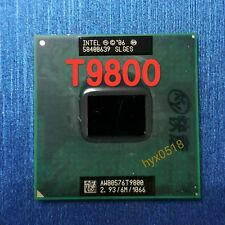 Processor number T9800. Type CPU / Microprocessor. Processor core Penryn. Core stepping E0. Case temperature (°C) 105. Number of cores 2. Frequency (GHz) 2.933. Processor Type Core 2 Duo. After Sale Socket 478, Socket P, PGA478. Bus speed (MHz)1066 MHz. CPU Clock2.93 GHz. 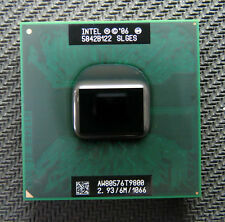 Processor Socket Socket 478, Socket P, PGA478. Processor only, no accessories included. In 100% working order. Number of Cores 2. Level 2 cache 6 MB. Socket Socket P. The number of CPU cores 2. Type CPU / Microprocessor. 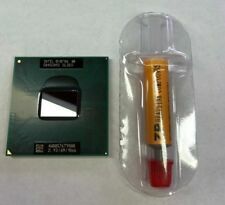 CPU part number. 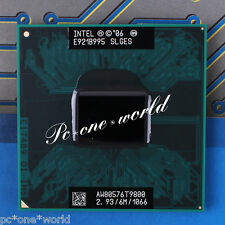 Processor core?. Frequency ?. Dynamic FSB Frequency switching?. Floating Point Unit Integrated. Trending at $23.29eBay determines this price through a machine learned model of the product's sale prices within the last 90 days. If you are not satisfied with the product because its faulty or you don't want it. 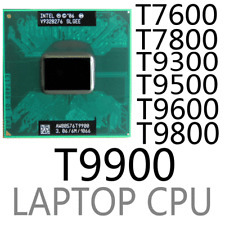 Processor Model Core 2 Duo T9800. Clock Speed 2.93 GHz. CPU Socket Type PGA478, Socket PGA478. Processor Quantity 1. Bus Speed FSB Speed - 1066 MHz. Product Identifiers. Multi-Core Technology Dual-Core. AW80576GH0776MG is an OEM/tray microprocessor. AW80576GH0776MG . Core stepping ?. E0 (SLGES). Part number SLGES. CPUID 1067A (SLGES). we specialize in computer accessories and so on. Minimum/Maximum power dissipation ?. Processor Type Core 2 Duo. After Sale. Processor only, no accessories included. DO NOT send without communication. Other country. Asia countries. USA&Canada&Australia. United Kingdom. Processor only, no accessories included. No one is EVER ignored! And help with inquiries. Hope not to bring you trouble. I will solve the problem. Pre-sale and after-sales service. Positive evaluation. We will provide you best service and high quality products. 1 x Cooling paste(free gift). DO NOT send without communication. canada Russia. Clock Speed 2.93 GHz. Processor Type Core 2 Duo. Processor Features Quad Core. Front Side Bus Speed 1066 MHz. New Brown No Tie Shoe Laces Silicone Easy Shoelaces For Adults & Kids Trainers . For Kingston SATA III SSD UV400 2.5" 120GB TLC Internal Solid State Drive (SSD) .